What is a parallel circuit or a series circuit? How does a fuse work? What is a short circuit? Simplify and understand circuit diagrams. 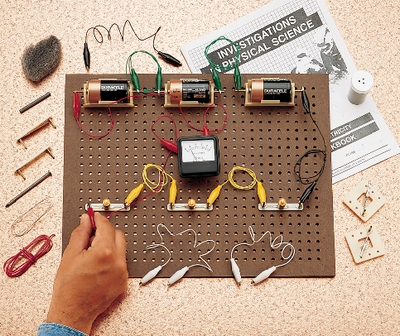 Experiment with the theory of electricity utilizing the unique “breadboard,” jiffy mounts and jiffy clips to perform experiments ranging from simple circuits through use of ammeters, resistance and how a fuse works. The heart of the program lies in the comprehensive teacher’s manual and student workbooks. Workbook options provide different levels of difficulty and interest. Each unit contains two workbooks, 0–1 amp Ammeter and a teacher’s guide.